The Playa Mar is to the north of Puerto Pollensa centre and its sandy bay. The promenade and pine walk along the bay is about 400m from the hotel. The main beach is 1.9km away. We have travelled to this location for ten years and have found the location to be ideal. Although the walk into the main square is around 20 minutes it is extremely pleasant along the pine walk and even better on the return with young children as this walk tends to calm them after a very busy day and exciting evening. For those people who are lazy please dont bother going to such an exciting and envigurating resort full of charm, you really would be better off going to Magaluf or some crappy Butlins as this resort is better suited to the quality of people who enjoy variety with the minimal of exercise and those who want food and entertainment on a plate stay at home, and dont spoil it for others as you lazy and probably fat people always block the pine walk. In summary if you dont like local culture go some where else please, we have spent the last 10 years having great family holidays and those who don't enjoy please go somewhere else!!!!!!!!!!!!!! Had a fantastic time at the playa mar, the hotel staff are friendly and helpful and the Thomsons team were the best I've come across, always full of enthusiasm and genuinely looked happy to be there. I emailed the hotel in advance to request a quiet room and that is exactly what we got in block 2. The rooms are well sized, plenty of wardrobe space, maybe a little lacking in the kitchen if you like to cook a meal but we only used the kettle and fridge, we're on holiday after all. The pool is great, starting from the walk in area and gradually getting deeper into the larger area where the water polo was played and then a deep pool as well. Although it was the height of the season in August I never felt it was too busy. There were some reports of early sunbed reserving before we arrived but throughout our stay the beds were piled up and chained overnight and were unlocked about 8ish each morning. I often saw beds available well past 9 which is considerably better than a lot of places I've stayed at. My first impression of the restaurant was that it would be too small but with a mix of self catering and half board it was never over crowded. We booked self catering and paid whenever we used the restaurant which turned out to be cheaper than going out and the kids ate better. The food is the usual buffet you get in Spain, plenty of it and lots of variety, except for the desserts which could have done with a bit more variation. The location was okay for us as booking independently we had a car. However, it is a good 20 min walk to the centre and I wouldn't have attempted it with our 5 year old. The beach close to the hotel is tiny and doesn't offer anything except a sunbed or two and the main beach is the other side of the centre so a taxi or bus is required. Having said that we did have the use of the car and chose not to use it as the kids clubs and entertainment at the hotel was so good. fanastic had great time the kids loved it. we,ve got alittle boy with autism but he thought it was great. the entertainers was fantastic my youngest even went to the kids club which we was very suprised about the was great with him. everything was great from the evening enertainment to the food and the staff. the rooms was very clean and the staff was very helpful. one night we forgot to get some milk for the youngest i went to the reception they went straight into the kitchen and fetched me a carton and they did,nt charge me. we originally went self catering but on arrival at this lovely hotel we decided to pay extra and have half board,the food is excellent and if you have small picky children like ours loads of english food to choose from. which is great but a little longer to walk to shops and restaurants great if the weather is okay. the hotel staff were excellent,very helpful and friendly. the entertainment was brilliant,somthing on every day for the children. On an evening after the childrens disco the entertainment was brilliant especially elvis and westlife tribute! the entertainers chloe and ryan were fab!!! very good with children and natural entertainers a credit to thompson! if we visit pollensa again we will definitley return here. the only negative if you can call it that was the weather on some days was a little cool and their is no heating in the apartments but hey everything else makes up for it. 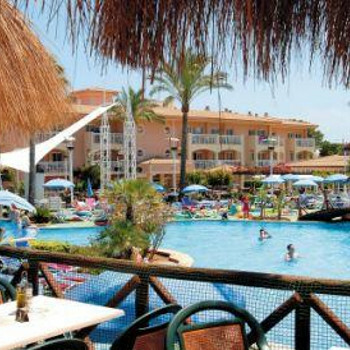 I would like to add that we booked this holiday very last minute as we had booked to go to an iberostar hotel in alcudia with a different holiday company but were let down by the hotel three days before departure as the hotel decided to close,which worked out better for us in the end! what a find the playa mar is!! This was our first visit to Majorca and what a pleasant surprise. The hotel was classy & clean. The room was spacious but with an 18 yr old and 15 yr old possibly sleeping arrangements were a little cramped but they had no complaints. The kitchen was small but all we wanted was to prepare breakfast as we like to eat out every night, plenty of room in the fridge. There was plenty of sun loungers around the pool and the entertainment was there if you wanted it. Ideal for families with small children as they were well looked after and catered for.Good fun for us as onlookers. All the hotel staff were pleasant and had good English, made us quite lazy not having to try out our Spanish. Pool bar well equipped with drinks and lunchtime snacks, bacon roll recomended! The hotel was on the outskirts of the main resort which was great for us. It took a leisurely 15 - 20 min walk along the pine promenade along the seafront to walk into town. Plenty of bars and restaurants to chose from. We even walked back on a couple of nights the walk is so pleasant. I found very little to fault really. Loved the island, loved the hotel, staff very obliging and pleasant including the very energetic reps. My hat comes off to them all! Entertaining kids is no mean feat day in day out. This is our third visit to the Playa Mar and hopefully not our last. The aparthotel is lovely . The rooms are spacious and clean, cleaners come in 6 days out of 7 and towels and beds changed about 5 times a week. Bedroom is large with plenty of wardrobe space. Living area is spacious. Kitchen on the small side but has everything you need, fine for what use we made of it as ate out all the time.Air Con is great. All rooms have a large balcony. Reception area spotless and huge. Reception staff all speak english are friendly and cannot do enough to help. Did not use restaraunt but poolside snack bar has lovely food. Pool is huge and pool area spotless clean. Pool never overcrowded even at busy times of day as it is so big. Only downside is having to get up early to get sunbeds but there is no way around this to keep everyone happy. Hotel has small supermarket which sells everything you can think of. Hotel is at quiet end of Puerto Pollensa in a residential area at the end of the Pine Walk, this walk into the resort centre is beautiful and makes the holiday for me. No good for heels tho as cobbled. Cannot comment on entertainment as did not watch any of it as were going into resort centre every night, However there were shows on every night. Perfect for families no good for couples as full of kids. We arrived at 4am and the only thing that disappointed us for the duration of our stay was that we could not get milk for a cup of tea! After the flight and bus ride to the resort, it would have been great to have a cup of tea then go to bed. Maybe the hotel could sell a small amount of tea, coffe etc for overnight arivals. The apartment was spotless and welcoming, the kitchen area is minute and not the best if you plan to cook all meals there. We did not have any kids with us, but if we had I know I would have thrown in the towel and ate out as the cramped cooking facilities would have driven me mad. On the subject of food, we ate in the hotel dinning area most nights and it was fine. Perhaps a bit repeditive but on the whole for 12 euros each, ok. The hotel is situated about 20 mins walk from the town, but there are different ways to get there. Its only 10 mins walk along the road or 20 mins walk along the beach front. This walk is beautiful to stroll along and the views are stunning across the bays. I agree I would not like to push a pram along the Pine Walk as its called, as the path is cobbled and uneven. We often hired a bike and rode into town, this was such a laugh and a great way to see things off the usual track. (5 mins ride into town) Taxi service is excellent and at 4-5 euros, not a bank breaker by any means. We enjoyed the fact that the hotel was just out of the buzz of the town. The pool area and snack bar are clean and absolutely fine. Sunbeds are not meant to be reserved but they are! Its annoying to see towels on beds and not a soul near them for hours. Once mentioned to hotel staff the towels are removed so its not that much of a problem really, just a minor irritation. It was quiet-ish while we were there but suitable to us.Dont think I could hack it high season but then our kids are grown up and we are away from the noise and stuff of kiddies. The mix was just right for our tatses. The hotel staff generally all speak good english and communication was fine. They all worked long hard hours and never once looked glum. Everyone was helpful and the Reps were always on hand and very helpful. No comments other than that, everyone was great. Entertainment wasn't great for adults but fine for kids. The acrobatic cats were fab, but other than that we sought our entertainment elswhere. The bars close earlish but that wasnt too much of a gripe.We didnt take part in any excursions preferring to explore by ourselves. We cycled into Pollenca ( hard going!) and were bowled over by it aucinticity and charm. Well worth a visit. We also went to Alcudia which is very cheap by bus from town and worth a visit. There are lots of local places of interest to explore if you look. Id recommend shopping at the supermarket called Caprebo not far from the resort as its well priced and varied. Local shops are a rip off. Water is much much cheaper in this shop so be aware. We would go back to Playa Mar in a heartbeat, but at the same time of year and not high season. I imagine it being too busy and noisy but fine for couples with kiddies and those who seek a busy atmosphere. What a wonderful holiday! We had a great time and will definitely be returning. We booked the flights and the accommodation separately which worked out slightly cheaper but came across a problem because we booked flights for 11 nights but could only book Playa Mar for 14 nights - Thomsons fault not the Playa Mar. Although we had booked self catering we did buy half board tickets for all of our stay because the food in the hotel was so great. There was plenty of choice for the children and for my husband who is a vegetarian. We did stay around the hotel for most of the holiday because we joined in, perhaps reluctantly at first, with the activities on site. The children loved this and we all had loads of fun. All the Thomson and hotel staff were fantastic and gave 100%, with a special mention going out to Cheeky Charlie and Impey, who were absolutely excellent. The entertainment on site was great, whether by visiting acts or the Thomson team. We had no problems with sunbeds, or queuing for the restaurant but this was probably because we went out of season but there were still people reserving sunbeds from early morning and not turning up all day! We went on one excursion, which was to the Pirate show. This was great and well worth doing. We booked with Thomson because it was only marginally cheaper to book through the hotel staff and they seemed unsure as to the details of the pick up times. Had a Thomson rep on hand all the time during the trip there was singing and games on the coach, making even the coach journey part of the fun. The only bad points during our stay: the bar prices were very high; also as guests were leaving they left their inflatables in large boxes which were located outside each block. This was great because there was loads of variety for the kids to play with in the pool but early one morning, a member of the hotel ground staff was spotted slashing all of them with a knife and taking them away - what a waste! A few of us complained about this but I would recommend that if you spot something in one of the boxes that you would like to rescue, take it up to your apartment overnight and bring it back out during the day! Apart from those minor points we had an excellent time. First and Foremost, we would return to PP, and the Playa Mar. Hotel is spotless, Hotel staff are 1st class, Maid service is great. Although Self Catering, we had breakfast once, excellent choice and very good standard. Location of hotel is OK, the Pine walk did get a bit tedious after two weeks, that is my only moan. Thomson Entertainers excellent, however, adult entertainment left a lot to be desired!! SUNBEDS - Not an issue, the only problem is the amount of space on the pool side to put them. Apparantly, they shipped a load more beds in the day before we arrived. Get your umbrellas early though. A thoroughly enjoyable holiday was had by all the family, and we would return. This hotel is spotless with excellent staff. The Thomson reps are also fantastic and very hard working. about 275 euros for four-one child -for five days. are crap however I think the chef was sacked when we were there as the meals improved after our five days were up. I Would suggest you ask other guests when you arrive and then take it from there. I would emphasize again all the staff at this hotel are top notch. What makes this hotel are the staff -HOTEL AND THOMSON-who cannot do enough for you but above all the other guests usually all with young children. and youngsters have a great time. The only pain is the sunbed or in this case parasol nonsense.The fault is not WITH THE GUESTS.More parasols should be available(I had to buy one).